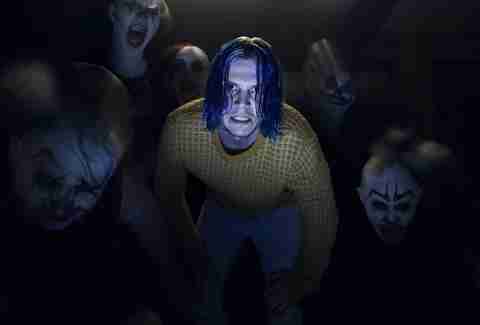 American Horror Story: Cult is wasting no time aligning the philosophies of its prime antagonist -- Evan Peters' Kai Anderson -- with those of other real-life cult leaders. There are notes of Charles Manson in his disheveled appearance and vacant eyes, and of Jim Jones in his rapt speeches and political prowess. Since the premiere, Kai has also used what seems like a brainwashing tool used to focus the energies of those he's manipulating -- a process that looks, on the surface, like the Scientology method known as "auditing." It makes sense that Cult would tip a hat to Scientology at some point. Though legally a religion, the Church of Scientology has faced a series of controversies since its inception in 1954, with many considering its practices and recruitment techniques of the cultish variety. Scientology received a fair amount of press in 2015 with with the release of the Emmy-winning documentary Going Clear, which chronicled several high-profile ex-members of the church -- including director Paul Haggis -- and their claims that Scientology is a scam religion that destroys families and abuses its members. Recently, the church lost another big name: actress Leah Remini, who documented her experiences in the popular A&E series, Leah Remini: Scientology and the Aftermath. In a recent interview with Cosmopolitan, she referred to Scientology as a "damaging, hurtful cult." It's hard to say how Kai's ideologies might align with those of Scientology founder L. Ron Hubbard, if they will at all. But his pinkie-locked spill sessions bring to mind the Hubbard-coined auditing process that continues to lure people into Scientology's eerie web. Is there a real connection between these two methods, or is it merely coincidence? You be the judge. Though audits are a routine part of life as a Scientologist, they're also something of a gateway drug. New members are lured into the church with a free test known as the "OCA," or the Oxford Capacity Analysis. The recruitment tool is offered online, but Scientologists often take to public spheres -- like local fairs -- to set up OCA test sites. The OCA isn't technically auditing, but it is something of an audit lite, an introduction to Scientology's desire to thoroughly know its participants. Once indoctrinated by the OCA or any other form of recruitment -- like, for instance, Dianetics, Hubbard's bestselling book about the philosophies of Scientology that has been known to spark the curiosity of members -- the auditing process begins. According to the official Scientology website, auditing provides "a precise path by which any individual may walk an exact route to higher states of spiritual awareness," and allows an individual to "look at his own existence and improve his ability to confront what he is and where he is." In layman's terms, auditing is a form of regression therapy meant to rid a person of emotional baggage and achieve a state of spiritual clarity. The audits occur in one-on-one sessions where the auditor and the auditee speak about very private personal topics with perceived confidentiality. But, according to former high-ranking member Marty Rathburn in an interview with The Washington Post, every audit is actually recorded and filmed. For some, this explains why celebrity Scientologists like John Travolta and Tom Cruise haven't left the church -- because the potential for blackmail is far too risky. This all begs the question: Is the auditing process personally beneficial, or is it merely a brainwashing tool to keep the Church active and funded? It's a hard question to answer, as everyone seems to have a different response. That's the nature of any therapeutic tool, but audits are especially controversial and hard to track. Some consider the practice dangerous. Hubbard claimed audits can clear a person of disorders like dyslexia and psychosis -- which means auditors are essentially practicing medicine without a license. Others (like singer Beck) have credited audits with curing addiction and other dark personal issues. Regardless, it's not hard to see how something so influential could be used to change and control the minds of vulnerable individuals. 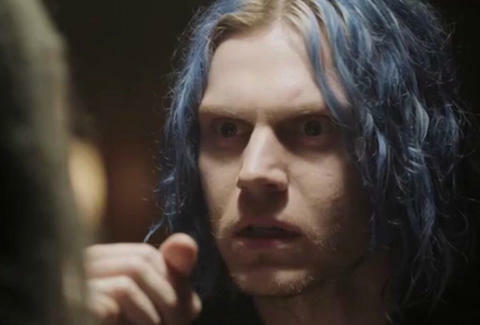 In Cult's first episode, "Election Night," Kai explains to his sister Winter as they're about to undergo their first ritualistic session that once their pinkies are locked, she must answer every question he asks. Similarly, in a Scientology audit, "preclears" -- or, the person being audited -- are told by their auditor that they will "remain aware" of everything that happens in the session. Once boundaries are established, the preclear is asked a series of questions that return them to past traumas or incidents, anything they feel they can "face." The auditor instructs them to make connections between these moments and others in their life as a means of understanding and combating specific issues. Audits are sometimes accompanied by the presence of an E-meter, a device that records electrodermal activity and is said to detect changes in the "reactive mind" of the preclear. Though an E-meter is absent from Kai's sessions, he does invite his participants to revisit notable moments in their lives, and to confront their demons. In "Election Night," he asks Winter a series of starkly personal questions: "What fills your heart with dread?" "What is your most humiliating experience?" "What's the most physical pain you've ever experienced?" "What's the most intense moment of pleasure you've ever had?" "Who was the last person that you wanted to kill?" In this week's episode, "Neighbors from Hell," Kai pinky inducts Meadow Wilton (Leslie Grossman) by presenting her with a similarly invasive proposition: "Tell me what you're afraid of." (Which she answers with a sarcastic quip about the Real Housewives -- to Kai's chagrin.) He then questions her existence as a motherless 40-year-old married to a gay man, and spoon-feeds her what sounds like fairly reasonable -- if somewhat extreme -- advice: "Stop saying sorry. For anything. That makes you nothing. Everything is somebody else's fault from now on. Do you understand? You wanna be somebody, you wanna matter? Then you make the world wrong." It's unclear just how involved Kai is in the murderous clown ring at the center of Cult, but it's looking more and more likely that he's the master manipulator. If that's the case, is he a Hubbard-like practitioner, using the mind-controlling tools of a predecessor to both heal and turn the people in his town? And if that's the case, who else will sit in his audit chair before the season wraps? No one seems safe, but with Ally's mental stability fraying, she appears to be a target of the cult. To what end? That remains shrouded in mystery.